2'2'' long and 14'' wide. This slab has a plain Latin cross. 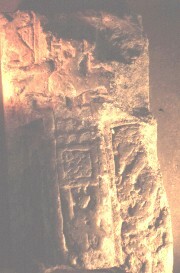 All the surfaces, on the cross and the background, have been decorated some with figural ornament. There is a possible Agnus Dei (Lamb of God) on the cross (Hawkes). Brown, G.B., The Arts in Early England, 6 Vols. 1st, , London (1903-37) Art, Architecture, England -- History..